Hungary's parliament elected a former skinhead as its deputy speaker in the first session since the national election last month which saw the neo-Nazi Jobbik party make significant gains. Tamas Sneider, 41, a member of Jobbik and leader of a skinhead group in northern Hungary in the early 1990s, was approved as one of six deputy presidents in one of the first votes by the new legislature. "As we all know about my past, I'd rather speak about (my plans for) the future," Sneider, who was given a suspended sentence in 1992 for beating a member of Hungary's largest ethnic minority the Roma, told a press conference after the vote. Some 150 deputies of the 199-seat house voted in favor of Sneider's appointment, including most of Prime Minister Viktor Orban's ruling right-wing Fidesz party who hold 133 seats. The new legislature was meeting for the first time since the 6 April election in which the governing Fidesz party regained a two-third majority of seats in the National Assembly. 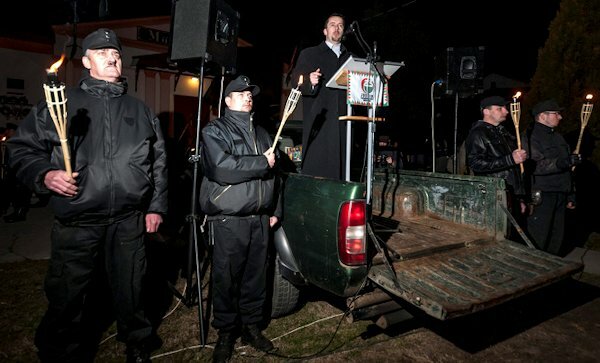 Jobbik, whose deputies have often made anti-Roma statements, won almost 21 percent of the vote, four percent more than in 2010, and now holds 23 seats in parliament.